Do you remember the story of Mary and Martha? They were two sisters. Both were unmarried. They had a brother named Lazarus, whom Jesus raised from the dead. All three of them, Mary, Martha and Lazarus lived together. And the three of them were good friends with Jesus. The four of them loved to get together and share a meal, tell stories, laugh, fellowship with one another. Sometimes, and this was the part they all like best-sometimes Jesus would get the Bible and explain Scripture to them in a way they had never heard. On a certain day, they had invited Jesus over for dinner, and wouldn’t you know it, he showed up early! This put Mary and Martha in a bit of frenzy, because it was just as difficult then as it is now when a dinner guest comes early for dinner. But they were all friends, and besides, Jesus had something he wanted to share with them from Scripture that he was very excited about. When he told them this, Mary put aside all the preparations and stopped what she was doing, and sat at his feet to listen to him. But Martha was so distracted by all the preparations, that she spent her time going from room to room, sweeping the floors, testing the soup, checking the bread, stoking the fire, setting the table and on and on. And remember, when Martha complained that Mary wasn’t helping, Jesus praised Mary for sitting at his feet and listening to him. He said that Mary had chosen what was better. We tend to criticize Martha for working and praise Mary for sitting, but I think we do this somewhat unjustly. In this situation, yes, Mary chose what was better. But Jesus’ point was that there was a time for sitting and learning, and a time for walking and working. Also, there is a sequence involved. Sitting at Jesus’ feet must come before serving Jesus. We should not work until we have learned. Well, the truth is that what you do is determined by what you believe. Correct duty is determined by correct doctrine. So it is vitally important to know Scripture and theology and doctrine, before you attempt to live your Christian life. Jesus taught this to Mary and Martha that day. Another person who knew this truth was Paul. This is why he began his letter to the Ephesians with doctrine before he gets to the duty. In fact, nearly all of his letters have this same pattern. Ephesians especially reveals this pattern. With Mary and Martha in mind that the key action word in Ephesians 1-3 is “sit.” We are seated with Christ in the heavenly places (Ephesians 1:20; 2:6). As we are seated there, he tells us what we have in him. He tells us of our riches and our royal position. As we sit at his feet and learn, he tells us who we are, what we have, what we are to believe. We’ve already looked at all of that. But after sitting for a while, God does want us to get up and do something with what He has given to us. The Christian experience does not begin with walking, but with sitting. It is as we mature as Christians, that we learn how to walk, just like infants growing up and maturing. That is the section of Ephesians we are coming to now. If Ephesians 1-3 was about sitting, Ephesians 4-6:9 are about walking. 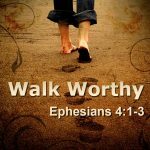 How to walk the Christian life. Ephesians 4:1-16 is about walking in unity. 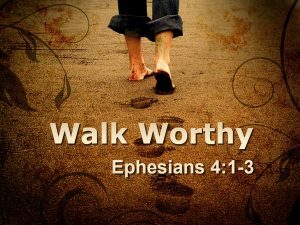 The term walk is found in Ephesians 4:1. Ephesians 4:17-32 contains instructions about walking in purity. Ephesians 5:1-6 is about walking in love. Ephesians 5:7-14 is about walking in light. Ephesians 5:15-21 is about walking carefully. The rest of chapter 5 and on into chapter 6 is about walking in this world. Near the end of chapter 6, the action word changes from walking to simply standing. The process of discipleship is “Sit, Walk, Stand.” We’ve looked at Ephesians 1-3 where we sat at Jesus’ feet. Now, we start walking. And the first thing step of our walk is to Walk in Unity. This idea is found in Ephesians 4:1-16, and is introduced in verse 1. This is Paul’s transition sentence. The word therefore points back to everything he has told us in Ephesians 1-3. We also see that he is a prisoner of the Lord. We’ve already talked about this back in Ephesians 3:1, so let me just review for you. 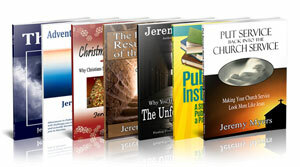 He is writing from prison, and he is in prison because he was faithful in preaching the Gospel. And even though he is actually a prisoner of Caesar, he knows that he is right where God wants him to be, so he calls himself the prisoner of the Lord. Now when Paul, as the prisoner of the Lord, began to talk, way back in chapter one, about the riches we have in Christ, he began that section with an introductory summary statement. Ephesians 1:3 says “Blessed be the God and Father of our Lord Jesus Christ, who has blessed us with every spiritual blessing in the heavenly places in Christ.” And then Paul goes on to talk for three chapters about these spiritual blessings we have in Christ. I beseech you to walk worthy of the calling with which you were called. It is that phrase walk worthy that summarizes what Paul is going to say. In the next three chapters, every time he gives us more instruction, he introduces it by telling us to walk in a certain way. We’ve already talked about this, so let me further explain this verse by defining that word walk. The term walk is peripateo in Greek, and it literally means “to walk about.” It has in mind the manner of life you live. The way you conduct yourself. It’s like when you walk around your neighborhood, you get to know people, they get to know you. You learn how people behave, and what they are like, and they learn the same things about you. Paul is giving us instructions here about how to behave. What your Christian walk should look like. We name things by calling it something. If an astronomer discovers a star, he can call it whatever he wants, meaning he gets to name it. So calling can mean naming. Parents, you call your kids in for dinner, or you call someone on the phone to invite them to come over for an evening of fellowship. Calling can be an invitation. Those of you who work for someone else might be called into your manager’s office so he or she can give you instructions for an assignment. Here the call is an assignment to a task. So the word calling is a diverse word. Its meaning must be determined by context. The context of Ephesians 4:1 tells us that the word is used in the third way I mentioned. As Christians, God is our boss, and he is calling us to perform a task. He is giving us instructions on how to walk as a Christian. And the first instruction is to Walk in Unity. We all want unity. We all want to be at peace with each other and love each other. Paul is going to tell us how. Now most often, when we are in a conflict with someone, when we are not at peace with someone else, we think it is the responsibility of the other person to change their ways, so we can get along with them. We point at their faults and what they said, or what they did, and say that if there is going to be peace, they have to change. But Christ tells us in Matthew 7 to do just the opposite. He says there to take the log out of your own eye first. And, not surprisingly, that is exactly what Paul says here as well. The way to begin walking in unity is to look to your own heart first. Ephesians 4:2-3 reveal the seven attitudes of Unity. The Seven Attitudes of Unity to have in your own heart. Ephesians 4:2-3. with all lowliness and gentleness, with longsuffering, bearing with one another in love, endeavoring to keep the unity of the Spirit in the bond of peace. These two verses list seven attitudes that you need to personally have in order to walk in unity. Let’s take them one at a time. Lowliness means humility, lowliness of mind, the esteeming of ourselves as small. The Greek word Paul uses here was coined by Christians. In Greek, there is no word for humility that does not have some sort of meanness or insult attached to it. Before Christianity, humility was not considered to be a virtue at all. The ancient world looked upon humility as a thing to be despised. The Greek language did have an adjective for humble, but it was always associated with being a slave, being without honor, cringing. If someone was described as being humble, they were looked upon as a cowering, groveling, beggarly, and inferior human being. And that’s even somewhat true today, isn’t it? It is not always a compliment to be called humble in today’s back-stabbing, self-advancing, look-out-for-number-one corporate economy. But one of the supreme virtues in Christianity is this lowliness, this humbleness. The same word is used only one other time in the NT, in Philippians 2:3 when Paul says that each one of us should regard each other as more important than himself. And there, in Philippians 2, who is Paul’s supreme example of humility? In Philippians 2:5, Christ is the supreme example! Though he was God, he made himself nothing. Though he had the right to rule, he became a servant. Though he was immortal, he died a criminal’s death on a cross. He who was exalted becomes despised, and he who was high becomes low. Jesus Christ is our example of this kind of humility. Here in Ephesians 4:2, Paul calls us to have this same attitude of humility and lowliness that Christ had in Philippians 2. Is that how you view yourself? As unworthy of attention? As the servant of all? As less important than anyone else? Or do you get upset when nobody notices what you have done and how much you know? The person who is lowly and humble does not expect recognition or repayment for what they have done. So first, we need to have an attitude of lowliness or humbleness. The word gentleness is a fascinating word in Greek. It comes from the word praotes, which means gentle or meek. In English, when we think of someone as gentle or meek, we think of them as weak. But praotes does not imply weakness. It implies great strength being withheld. Think of a gentle giant. Great strength under control. I am by no means super strong, but when I hold my newborn daughter, I feel like a powerful giant with her frail body in my hands. So I hold her gently. That is what this word has in mind. But another aspect of the word is found by looking at its root. In Greek, the root of praotes is praus. Praus is the word used for a tamed beast. In Greek, a praus was an animal, like a lion or a bear, which has been trained and domesticated until it is completely under control. So a tamed man, a gentle man, is the person who has every instinct and passion under perfect control. So when we take all of this, and put it together, we should not be picturing a docile creature. Many of tend to think that being gentle means being compliant, mild-mannered and complacent. It means nothing of the sort. Gentleness is power restrained. Controlled ferociousness. This means that someone who is gentle can till use force, and can still get quite angry when circumstances call for it. So being gentle does not mean never getting angry. There are times to be angry, and if you are gentle, if you are praotes, you will know when to be angry, how to be angry and what to do when angry. First, lowlinees, second, gentleness. Third, we are to long-suffering. The word here is makrothumia, and can also be translated patience. This word was used when explosives were invented of having a long fuse. Again, it does not mean a lack of power. Does dynamite lack power? No. It has the ability to destroy and annihilate. But a stick of dynamite with a long fuse takes quite a while to explode. And power like dynamite is exactly what you have in Christ as we saw in Ephesians 1-3. So you need to make sure you have a long fuse on your power. Very possibly, there are people who are trying to provoke you, trying to get a reaction out of you, trying to get you to blow up in anger. But if you are long-suffering, macrothumia, you show a quality of self-restraint. It is when you do not hastily retaliate. You are self-controlled when provoked. You have the power to take revenge, but you do not. You have a spirit which refuses to retaliate. We have all known people who blow up in anger at the least little thing. That is someone who has a short fuse. Here Paul calls us to have long fuses – the ability to bear insult and injury without bitterness and complaint. God’s patience toward us is the perfect example. Time after time we sin. Repeatedly we say, “I’m sorry God. Never again will I do that.” But a day later, a week later, a month later, we’re back at it. But God, in His incredible patience works with us, and time after time forgives us. That is true long-suffering. Fourth, we are called to bear with one another. To bear with one another means to “put up with one another’s short comings.” That kind of has negative connotations, but Paul meant it in a positive way because we are to bear with one another in love. It is like when you parents put up with your children’s short comings because you love them. You know they are maturing. You know they are learning. And so you bear with them in love. And that’s the fifth attitude. We are to bear with one another in love. This love, as I’m sure you can already guess, is agape love. This is unconditional, no-strings attached, unending, eternal love. It is the kind of love Paul describes in more detail in 1 Corinthians 13. It is the kind of love God has for us. It is the kind of love that put Christ on the cross for us, even though we were sinners. If we love someone with agape love, it means that nothing he or she can do will make us seek anything but the highest good for them. Though they insult us and injure us, we will never feel anything but kindness toward them. It is the ability to love the unlovable, to love those who hate you and to love those who don’t want your love. It is obvious that this kind of love is not an emotional love. It is a love bound to the will. It is the love that loves a person when all your emotions scream out to hate them and retaliate against them for what they have done to you. It is the kind of love that keeps marriages going when the honeymoon is over. It is the kind of love that allows Christians to walk in unity. Agape love, the fifth attitude. Sixth, in Ephesians 4:3, we are endeavoring to keep the unity of the Spirit. And do you think that gladiator made every effort? You bet he did! If he let down even a little bit, it could mean the loss of his life. It is the same for the Christian. But we are not endeavoring to keep ourselves alive. We are endeavoring to keep the unity of the Spirit. Is interesting what Paul is not saying here. 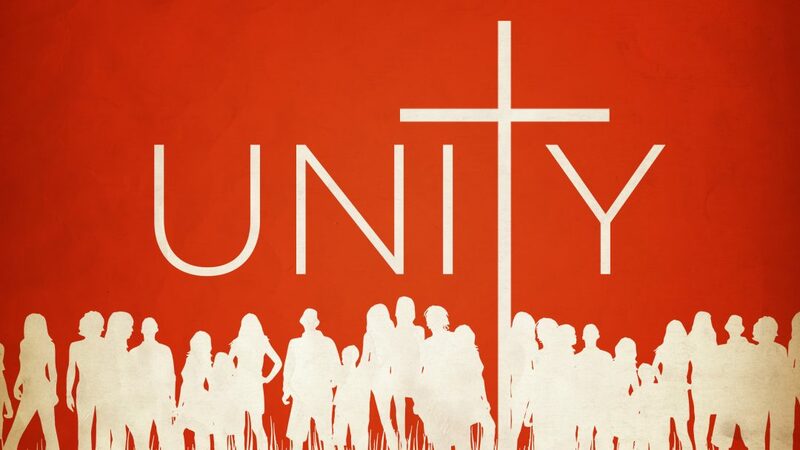 There is a lot of emphasis today both in the world, and in the church, on making unity. 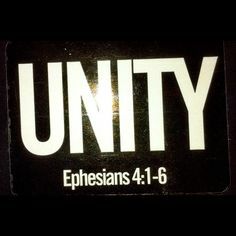 But Paul here is not calling us to make unity with one another. He is telling us to keep what we already have in Christ! Unity does not come from us, it is given to us by God when we become Christians, and it is simply our task to maintain it in the Spirit. The phrase unity of the Spirit is just a way of saying that we are all one in the Spirit. We all, as Christians, have the same Spirit. The Holy Spirit indwells us when we become Christians. So when we are in disunity, it is like we are trying to divide God. But God cannot be divided, so disunity is contrary to the Spirit living within us. So the six attitudes so far are lowliness, gentleness, long-suffering, bearing with one another, in love, and endeavoring to keep the unity of the Spirit. The seventh and final attitude is the last phrase in Ephesians 4:3: The bond of peace. Peace with others begins with peace with God. If you are not at peace with God, there is no way you can be at peace with others. It is only when the peace of God rules in our hearts that we can build unity with one another (Col. 3:15; Jas. 3:13-4:10). So those are the seven attitudes to do a heart-check up on any time you find yourself in conflict. The first step is to check your own heart. These seven attitudes are much easier said than done. If you have ever been in a conflict with someone, you know how hard it is to maintain an attitude of lowliness, gentleness, long-suffering and love, unity and peace. But, if you find these difficult when you are embroiled in a conflict, don’t forget what you have in Christ from Ephesians 1-3. God never asks you to do something without first telling what He has done for you. God never asks you to give something without first telling what He has given to you. What if I asked you to give $100,000 to the church next week? What would you think? You would think, “There’s NO WAY! I don’t have that kind of money!” But what if I first informed you that Bill Gates had just decided to deposit $1 Million into your bank account with the minor stipulation that you give 10% of it to the church? Then the $100,000 is no big deal, right? You get to keep $900,000. What made the difference? Both times you were asked to give the same amount of money, but in one situation, you said, “NO WAY!” and in the other, you said, “No big deal.” The difference was that in the second situation, I told you what you already had, and so giving a small portion of it was no big deal. The same exact thing is going on here in Ephesians 4. Paul has just asked us to do something very difficult. He has said that when you find yourself in a conflict, check your own attitude first. And if this seems hard to do, remember what you have in Ephesians 1-3. You have the power of God to do what you otherwise could not do. On your own, you might not be able to be humble and gentle and longsuffering toward that person. On your own, you might not be able to love that person and to be at peace with him or her. But with the power of the Holy Spirit within you, you can do what would be impossible otherwise. Remember, Paul was writing to a very diverse church in Ephesus. It was made up of Jewish and Gentile believers who could not get along no matter how hard they tried. In Ephesians 2, Paul called them to be a peace with each other. Now he tells them the first way how. He tells them it begins with their own attitudes. He lists seven of them here. And you know, although Paul is writing to Jewish and Gentile Christians in the 1st Century AD in Ephesus, we can apply this same principle to all of our present day relationships. Do you have any damaged relationships at home with your spouse or your kids? Do you have any conflicts at work? How are you getting along with your neighbors? Do you dread those calls from your mother in law? If so, step number 1 is to focus on your own attitude. In Ephesians 1-3, we’ve sat and learned at Jesus’ feet, just like Mary. But now, it’s time to get up and walk, like Martha. And walking always has the purpose of arriving at a destination. This first destination we are walking toward is unity. And we have seen the first step toward unity today, check your own attitude. There was a time all of humanity got along. Lived together in peace, built their city together, ate, slept and cared about working together. God saw it, didn’t like it, destryoed it. The place was called Babel. Jeremy, you said that….. “Jesus wants us to live in unity with each other. Yet Christians are rarely able to do this”. In the Purpose Driven Life, Rick Warren observed that “God expects unity, not uniformity”. I wonder if “Christians” are actually seeking uniformity. In math when A=C & B=C then A=B. But if B is not = to C then A & B are not equal. It seems that rather than trying to get B to = A we need to get B to = C.
In a recent exchange about John 15 you said that you understood that “the John 15 image is about Jesus pruning and tending to believers”. My understanding is that since “the Father of me the Vinedresser is” then the “pruning and tending to believers” will be done by the Vinedresser Father…. not by the vine Jesus. I agreed with John 15:1, you disagreed with it. This left us in disagreement with each other.